The FoodSaver V3240 Vacuum Sealing System extends the shelf life of foods up to five times longer than other storage methods like putting them in Ziploc bags or wrapping them in aluminum foil. Vacuum sealing foods removes air and extra moisture—two things that cause rotting and spoiling. Vacuum sealing can also help enhance the flavor of your food when you use it to prepare meats and vegetables for Sous Vide cooking recipes. You can purchase FoodSaver lids and sealers to create airtight bags and canisters when using the accessory port. You can also customize the size of the bags by using the built-in roll holder and cutter. This starter kit also includes one 11″x10′ Roll, three Qt Heat-Seal Bags and two Gal Heat-Seal Bags. This whole package sells for around $120. Vacuum seal all kinds of foods from meats to vegetables. You can also marinate meats. By sucking all the air out, the juices of the marinade seep deep into the meat, creating a flavor-packed cut. But it doesn’t just vacuum seal food. Documents you don’t want to ever get damaged like your marriage license and birth certificates can be vacuum sealed to protect from ever getting wet or torn. The FoodSaver V3240 Vacuum Sealing System has a sleek design and is easy to use. It is user friendly and comes with two sealing options: Seal and Vac/Seal. That means you can just seal the bag without sucking out the air or you can vacuum all the air out and then seal. It also has a port to plug in attachments for extra sealing options. Select an appropriately sized bag or cut the required length of the bag from the roll by using a pair of scissors and sealing one side with the seal button. Add food and place the open end of the bag into the vacuum channel. In order to prevent the crushing of delicate foods, press the seal button before of the vacuum process finishes. The FoodSaver v3240 Automatic 2-Speed Vacuum Sealer does not require much maintenance. Unplug the machine before cleaning it and wipe it with a damp sponge. Never use abrasive and always keep the lock cover open when storing. This FoodSaver V3240 machine comes with everything you need to start your vacuum sealing operation. The special handheld vacuuming hose can be used with other FoodSaver accessories for vacuum sealing jars and canisters or for marinating foods. 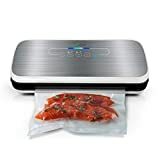 This vacuum sealer is easy to use; after reading the instructions in the manual, you’ll be vacuum sealing with so much ease, your friends will think you’ve been doing it for years. The FoodSaver v3240 Automatic 2-Speed Vacuum Sealer extends the life of virtually every food. It also seals any tangible, nonperishable item you want to preserve and protect.